The American Library Association (ALA) played a major role in serving the military in World War I. The efforts of ALA were influenced by various approaches to library service to the military which were being carried out in Great Britain. Theodore Wesley Koch was sent to London by Librarian of Congress Herbert Putnam in 1917 , and while there Koch became familiar with the British library service efforts. Koch wrote extensively about library service to the military during World War I. In Books In The War: The Romance of Library War Service (Houghton Mifflin Company, 1919), Koch has a chapter (Chapter XI, pages 197-215) on the British Camps Library. I recently acquired the Camps Library bookmark shown above. The Camps Library was originally established by volunteers to serve soldiers from other British Commonwealth countries who were to be stationed in Great Britain. This mission was greatly expanded and the Camps Library eventually served soldiers and sailors abroad including those in prison camps. 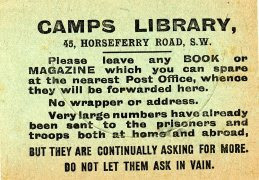 As a collector of postal librariana, I was particularly interested in the request on the bookmark to leave any book or magazine at the Post Office where it would be forwarded to the Camps Library for distribution to soldiers and sailors in the military. In his book Koch, explains that this Post Office and Camps Library connection was a major factor in getting reading matter to the troops. Koch quotes the following tribute to the Camps Library: "Of all the boons that have been booned by the British Public on the British fighting men, one of the best is the distribution of books and magazines carried out by the Camps Library. I dunno who or what the Camps Library is, or where it sprung from, but the people that run it --well, I take my hat off to them every time." The Postmaster General of the United States implemented a similar scheme in America. For one cent postage, magazines place in a mailbox would be forwarded for use by the American Library Association in serving soldiers and sailors. By coincidence, I'm writing about the war service right now in my dissertation. It isn't quite as cheery as Koch's book, though. "The American Library Association (ALA) played a major role in serving the military in World War I." Correct. But times have changed. See, "American Troops Defamed by ALA Councilor Peter McDonald." See also, "ALA Defends Book Confiscation Worldwide by Communist/Terrorist Regimes? SafeLibraries Asks ALA Councilor James Casey to Clarify Anti-American Stand."